part 1 (and your comments) is here. 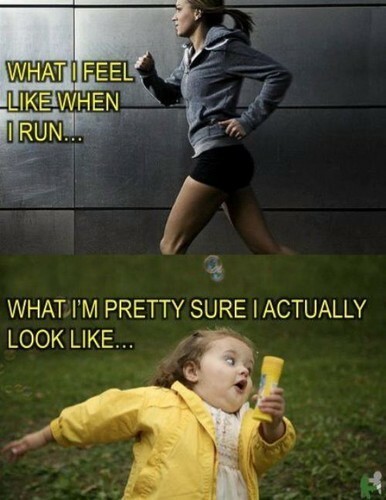 On the runs, you usually feel like a heavy turtle. But after every run, you are wonder woman. Or Superman. You have Vaseline jars everywhere. You start ignoring every little running gadget or fad. You get really upset if called a jogger. NOT cool, people! You know not to stop for water in a 5K. You coordinate your running outfits based on the type of workout you have a ahead. You know you can get chicked or geezered at any time. You learn there aren’t any other terms more relative or subjective than slow and fast. You know than BQing is the Holy Grail for most of your friends. You agree with Nike on most days. Just do it. Unless we are talking about cotton. Then don’t. You have a laptop sized watch and you love it. Your family knows what tempoing or chafing is about. You can talk about Galen, Alberto, and Mo by the watercooler like they’re in a reality show. You have, at some time or another, run with a metronome. You have most of your upcoming weekends accounted for. All so true!! I have most of my upcoming weekends accounted for! I have run with a metronome. I won’t even stop for water in a 10k. And yes I have stopped buying running gadgets, even at big expos! I get sooooooo ticked off if someone refers to me as a jogger! OH PLEASE!!!!!! Sometimes my husband says it just to get my goat. What pray tell do you mean by “geezered”? Not nice. What you thought! Inlove it when people that are way older than me pass me, it means there is still a long way for me to go get faster, hopefully!!! !